What's the best way to shave your head? What's the best razor shaving your head? 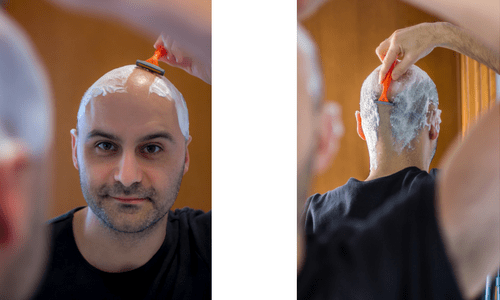 Should you use an electric razor for shaving your head? Shaving your head bald can be pretty intimidating. Whether you are going bald, or have a full head of hair, you might be a little afraid to take the plunge. What if you look funny bald? What will people say when they see your bald head? Is it hard to do or to maintain? Once you finish reading this article you will see that the answer to those questions is very simple. There is nothing to worry about if you shave your head! I have said it a million times in this blog, but I will repeat it again. It is a good time to be a guy! You can shave your head and it is not a big deal. Many of you reading are probably too young to remember Kojak. If you shaved your head back in the 70's or 80's, heck even into the 90's, people would call you Kojak. That could get annoying really fast. Luckily, now, most people don't remember who that was and couldn't care less about making the comparison. It's not so unusual to have a shaved head these days. It feels amazing to shave your head. I did it for years. The shave itself, when done properly, feels really good. After shaving, your head will feel tingly, cool and invigorated. Especially when using some awesome skin care products that will help you maintain your bald head. If you're thinking of shaving your head or you already have but want some advice on how to do it better, this article will help. 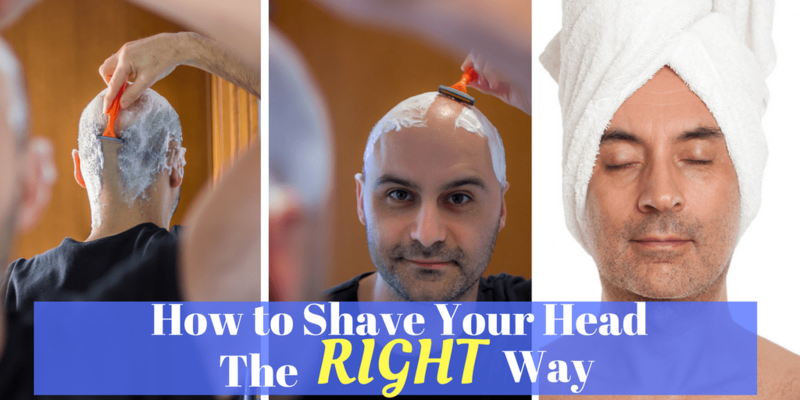 By the time you are done reading this guide, you will have the confidence to shave your head. Once you do, you will never look back! If you are in the beginning phase of pondering what to do with your balding head, check out this article about how to deal with going bald. There are a few things to consider before you jump in and shave your head. The biggest thing is to consider what the state of your skin is like underneath your hair. If you have some acne or rash, you will need to take care of that before you shave it with a razor. Even a regular cartridge razor will do some damage if you have blemishes on your skin. The last thing you want is for your head to end up a bloody mess. Buzz it down to a centimeter or so and use some creams or ointments to get your skin back to being healthy. Then when it's time, you can follow through with your plan to shave your head bald. Keep in mind that your skin under your hair will be much paler than the rest of your hair. It might be a good idea to buzz it short and let it get a little tan first. Since it has been shielded from the sun, it is also a bit sensitive. You need to be careful about getting too much sun right after you shave it. Getting sunburnt on your head right after shaving will be torture! I don't recommend shaving your head while you taker a shower. Besides the water wasted, you will have a hard time making sure you didn't miss any spots. You should shave your head in front of a mirror. Seeing what you are doing will help to make sure you are doing a good job. For the areas you can't see, i.e. behind your ears and back of your head, it is easier to feel the spots you missed by feeling around with your hand. In the shower, it's harder to feel those spots. Before you get started, you want to make sure you have everything you need. You don't need to spend a fortune here, but don't get cheap either. You want the right tools and products for the job to do it right. If shaving your head is going to be a regular thing, you want it to feel great and not be a chore. Using good products makes it easy and enjoyable. I'll go through each of these items and give a recommendation on which ones I think are best. Electric clippers: If you have more than a centimeter of hair, getting the hair down to stubble with an electric clipper is essential. Trying to shave hair with a razor will be a lesson in futility. Your blade is not cut out for that. How good a clipper you need will depend on how long your hair is. Razor: Since your head is different than your face, you want to approach your razor selection a bit differently. A razor with a ball swivel that goes with the contours of your head is best. Try to avoid a cheap, disposable razor with one or two blades. Those will probably nick you. Shaving cream: Lubrication is very important for a smooth head shave. You want the razor to glide. For a close head shave, it's important for the lather to be absorbed into the hair. Which means no shaving gel or canned foam. The best way to shave your head is to use a brush and shaving soap or a cream. Shaving brush: It will take a few extra minutes to do a shave with a badger hair brush, but it is worth it. Getting a good, wet lather will result in a much, much closer and comfortable head shave. Shaving soaps that are meant to be used with a badger hair brush for a traditional wet shave are ideal for shaving your head. After shave lotion: To disinfect your skin, tighten your pores and moisturize your skin, you now need a good after shave lotion for your shaved head. It's probably the best part of shaving your head. Rub some in and let it do it's magic leaving your bald head feeling fresh and clean. Before you go out and get a set of clippers, let's see what kind you need. If you already buzz your head down, skip this section. You want to get your hair down to about 1 to 1.5 millimeters for a great head shave. There are clippers that will get it down to almost the skin, but I don't recommend getting it that close. One of the keys to a great shave, whether on your head or face, is for the hair to absorb a lot of water. The closer the stubble to the skin, the less water gets absorbed making for a bit of a rough shave. Too long, though, and the razor will struggle with the hair. The sweet spot, in my opinion is around 1 to 1.5 millimeters for maximum water absorption. For longer hair I recommend the Wahl Chrome clippers. Though these aren't clippers I would use in the shop everyday, they will do the job if you are just trying to buzz your head down to shave your head. It has attachments, so if your hair is long you might want to go in stages. Put on an attachment to get it down to around an inch or so. Once you have it manageable, take off the attachment and with the blade exposed, turn the lever to close it to halfway. To buzz your hair to the right length, close the blade halfway with the lever located on the side. This will bring the hair down to around 1 millimeter. You may have hair all over you at this point and want to take a shower. This is a good way to get your stubble nice and wet to be ready for a shave. If you already have buzzed hair or you want to wait to take a shower until you are done, then get yourself a small towel. Soak the towel in hot water. As hot as you can safely handle without burning your hands or scalp. Squeeze it out, but, not too much. You want the stubble to absorb a lot of water, so don't make it too dry when you squeeze it. Then wrap your head in the hot, wet towel and leave it on there for a couple of minutes. You can use this time to get the rest of your gear ready. If you are using a badger hair shaving brush and shaving soap, and I highly, highly recommend that you do, this is a good time to get it ready while your head gets prepped. Have a small bowl with hot water ready and dip your brush in. Work the bristles until they have absorbed the water. Around 30 seconds or so. Add a dab of shaving soap if you are using the cream version. Just rub the cream in with one hand while holding the brush with the other. If you have a disk, drop it into a shaving mug and work the brush around it creating a lather. 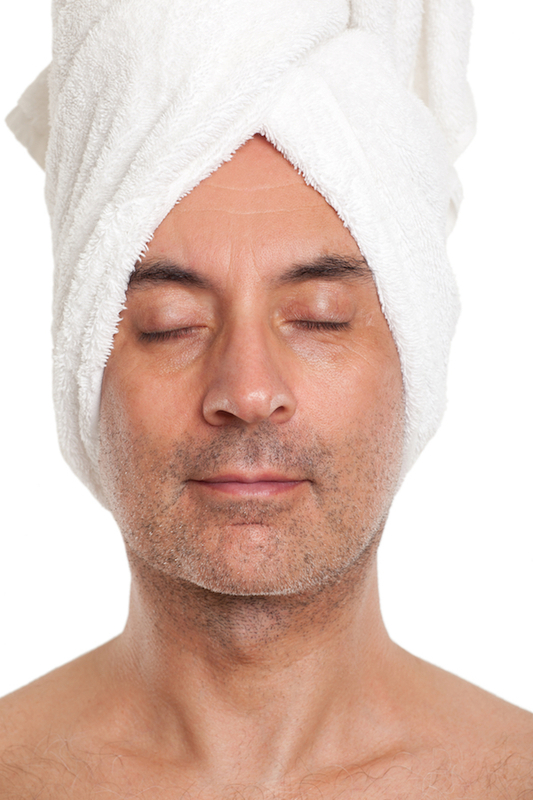 Take off your towel and start working the lathered brush around on your head. Slowly work it in in a circular motion. Do it slowly so you don't have lather flying everywhere. And make sure the lather isn't too wet. You don't want it to run down your head. Have a dry towel handy in case it does run. This is going to get your pores open and the stubble will absorb the water well. If you don't want to use the badger hair brush, make sure you use a high quality shaving cream. Not a gel. Not one from a can like Barbasol or anything like that. You need the hair to get wet, as I have stressed a bunch of times already. Those shaving creams just help for lubrication. Your hair can't absorb any water from them. It might seem like they work well since there will be no drag. The reality is that they don't help much. Apply this as soon as you take the wet towel off of your head and really rub it in. Work it into the stubble. Add a little water if it doesn't feel wet enough. Now get your razor out. Fill your sink with cold water to rinse your razor with. You will want a good razor here. Forget about going too cheap. Don't go with a disposable. Get yourself a cartridge system. One with a ball system is great. If it can flex and move around with the contours of your head, you will reduce the risk of nicks and cuts. Don't go with a safety razor or straight edge! That is way to risky to do on your head and can result in a serious injury. I love the Dorco Pace 7 for this since it has 7 blades, and a ball swivel system. Not to mention it costs a fraction of a Gillette Fusion! Use smooth, easy strokes. Start at the front and work your way back. It's best to go with the grain. When you get to the back, it will be difficult to go with the grain. You will probably have to go from the bottom up which is the opposite of how the hair grows. This is where your prep will really help you out. If you rushed getting your head ready, this will probably feel rough since you are going against the grain. not to mention you might end up with an irritated head or risk of ingrown hairs. This is why I can't stress enough the need for a badger hair brush for shaving your head. Some guys want the simplicity of just using an electric razor system to shave their head. Others don't like the feeling of shaving their head with a razor or have sensitive skin. Whatever the reason for wanting to use an electric razor for shaving your head, it is not a bad idea. There are some really good ones out there now that will do the job quickly, easily and with no mess. The one I use in the shop and used on my own head a few times is the Andis cordless electric shaver. It's not too expensive and really gets the hair as close as a blade does. The gold foil makes it a smooth experience, too. For an even easier and smoother electric shave experience you can try the Bald Eagle by Skull Shaver. This has 5 rotating heads that swivel and really get into every contour of the head. I'll admit that I have yet to try it out as it is a bit pricey. This is no doubt the best part about shaving your head. After you have finished shaving and taken a shower, it's time to rub your head down with an invigorating after shave. This will tighten up the pores and moisturize the skin. In essence it will repair the damage done by the blade. Or, electric shaver for that matter. Even if you use the machine, you should finish with a high quality after shave lotion. Always use an alcohol free aftershave lotion. Alcohol will dry out and damage your skin. It also feels like a million fire ants have covered your entire head. I love Proraso products in general, but I really love the after shave lotion. It is alcohol-free and leaves the skin feeling incredible. It has a non-greasy formula so won't leave your bald head shiny. The eucalyptus oil is refreshing and soothes the skin. Don't be intimidated and think that maintaining a bald head is a lot of work. It is actually much easier than dealing with hair. Your bad hair days are over. You don't need to buy expensive gels, shampoos or conditioners. It takes seconds to get ready in the morning. So, doing a little maintenance on your bald head shouldn't be an issue. You want to show off your bald head. Wearing a hat really ruins the effect of taking the time to shave your head. Wearing a hat during some intense, sunny days will go a long way to avoiding sun burn and reducing the risk of skin cancer. At least you don't have to worry about hat head! If the sun isn't too strong, you still need to take some precautions. Use a good sunscreen. Find one with a non-greasy formula so your head doesn't shine and blind everybody around you. You don't need a special shampoo for your head. Use the same stuff that you use for the rest of your body when you shower. You should be using a good, natural soap for your body and head. Many non-natural soaps will dry out your skin. You might think that your days of getting dandruff are over now that you're bald. If you are using a cheap, harsh soap, you will dry out your head even worse than when you had hair. When you had hair, at least it trapped the body's natural oils and kept your skin moist. That is gone now, so you want to use a good soap. A few drops of argan oil every other day or so will do wonders for your skin. You should use it everywhere, really, but, we're talking about your bald head here. It will leave your skin so smooth you will have a hard time resisting rubbing it every few minutes. That goes for the ladies, too! After all, that's the real reason you want to keep your head in tip top shape, amirite? When you apply it, make sure you give yourself a good scalp massage. This will not only really get the oil into the skin, it will improve the circulation. That improved circulation will make your head feel and look great. The added blood flow to your head will give your skin a healthy glow. Just use the tips of your fingers to apply a gentle pressure as you work them around your head. Do it for at least 5 minutes a few times a week and watch what a dramatic difference it makes. Are you ready for an incredible feeling head? Are you ready for people to comment how good you look bald? Oh, trust me, they will. There is no such thing as a head that doesn't look good bald. There is only time to get used to seeing yourself bald. When I shaved my head, I thought I had made a huge mistake. I thought I looked ridiculous and got ready for the comments about how extreme I looked and that I looked like a freak. It didn't happen. People complimented me all the time when they first saw me. I just needed time to get used to seeing myself in the mirror with no hair. You might find after time that you don't like the bald look. The good news is that your hair will grow back. You could do like I did after a couple of years and just go with buzzing your head with clippers, keeping it close to shaved. There's really nothing to lose! Now be a sport and Click Here To Tweet this article! And make sure you share this with somebody thinking about shaving his head. The social icons are at the beginning of the article.